This is a review of what we currently believe to be the current best wireless gaming headsets for PC in 2017 to help you shop smarter. Choosing between wired or wireless headsets can be confusing because you'll hear some people write off wireless headsets for gaming because they're too "laggy", whilst others will say you won't see a difference and that audio lag is a myth. What's a gamer to do? Well, like many things in life, the answer lies somewhere in the middle. The better wireless PC headsets out there are unlikely to experience audio "lag", but it's always possible. However you're unlikely to notice much difference. But what you gain in freedom with a wireless headset, you may lose a little in sound quality, as wired headsets offer the best studio-quality sound. If you compare a wireless headset vs a wired headset around the same price tag, the wired one will almost always win out on overall sound clarity and quality. But in saying that, there definitely are some great wireless options out there, and we've picked out the best of the bunch below if you really prefer having added freedom from annoying cabling. If your budget is under 100 dollars for a good wireless headset, the Corsair Void Wireless Gaming Headset is what we'd recommend. 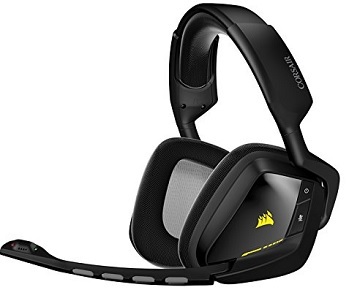 It's one of the best-quality, most reliable budget wireless headsets for gaming on the market today with minimal chance of encountering issues with audio lag. It will work within 40 feet and for 16 hours without needing to charge, although keep in mind that time may shorten as your headset ages. As for how long to charge; usually around 2 hours, and yes you can still continue to use the headset whilst it's charging. It also has genuine Dolby 7.1 surround sound which is a nice touch for the price, a decent noise canceling mic, and reportedly has decent comfort for most head sizes. To top things off it also has cool customizable RGB lighting. 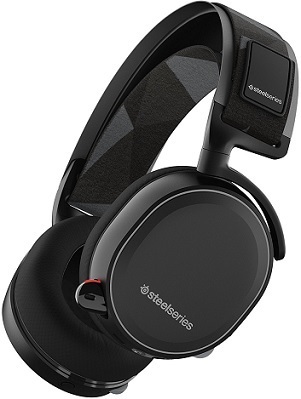 Moving on up the ladder and the SteelSeries Arctis 7 Wireless Gaming Headset is currently one of the very best bang for your buck wireless PC headsets under the 200 dollar mark without question. It boasts flawless wireless capabilities so you don't have to worry about audio lag and a premium ski-goggle-like steel headband that comfortably wraps across your head and distributes the weight nicely. Sound quality is top notch and it has 7.1 surround sound. The discrete mic is also high-quality with effective background noise cancellation, and it can be used within a nice 40ft/12m radius. Battery life is said to be up to 24 hours too which is real nice compared to other models. Overall, the Arctis 7 is one of a kind and we can't recommend it highly enough. 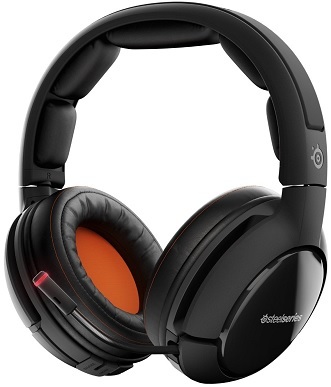 In terms of the current best high-end wireless PC headset, we're giving the SteelSeries Siberia 800 Wireless Gaming Headset the slight nudge over the Astro A50 but in truth it was a tough call as both are high quality, reliable wireless solutions for unrestricted gaming. The Siberia 800 has two hot-swappable battery packs that'll last for up to 20 hours of gaming on a single charge. It's a nice unique feature that allows you to quickly and easily switch batteries when you need to. The microphone is a noise canceling and unidirectional, that can retract and has a handy LED signal for the mute function. It offers seriously good quality sound that will beat pretty much every other wireless headset out there, and it has great wireless range. It has an closed-ear design but it doesn't feel hot and restrictive after long gaming sessions because the ear pads are nicely designed, soft and pliable. Got a question or want to share your thoughts on the above guide? We're listening and you can reach us on the platforms below or email us direct and we'll gladly help you out where possible if time permits. If you need more in-depth help with tweaking a build or planning one from scratch for your specific budget/theme/performance aims/etc - see our Get a Done-for-You Parts-List service where for a small tip we can thoroughly research and plan the very best build for your exact wants and needs. Also, constructive criticism on any aspect of the site is always welcome and appreciated as it helps us continue crafting BGC into the best noob-friendly DIY resource that it can be. Thanks guys. Former hobbyist game programmer turned tech fanatic, Julz is the founder and lead author at BGC and has kept a keen eye on the latest in DIY gaming since starting the site in his spare time over a decade ago as an almost-laughably basic, unimpressive little site with a simple aim to try and make building a PC more accessible to the average gamer since most resources were far from beginner-friendly. Over countless reiterations to the quality and depth of the site's content and research process over the years, it's steadily grown into the fairly expansive, comprehensive and constantly-updated PC building resource that it is today, now reaching and helping thousands of gamers and power users each and every month to more effectively plan optimal setups for their exact needs. His fav PC games of all time are HL1, WC3 and SWKOTOR (OOT, Perfect Dark, DKC2 & MGS2 for consoles) and he promises never to speak in third-person again. You can learn more about the BGC mission here.